Today is the official opening date of Star Wars: The Force Awakens! I've already seen some shouts of joy from my friends who actually went last night to see it in theaters and I can't wait to experience it with my oldest son tomorrow morning. For those of you who appreciate the history of the franchise and are looking forward to seeing some of the classic charaters make their triumphant return to the big screen, I've found several great documentaries on YouTube to experience. There are actually dozens available, but the few that caught my eye were either filmed during its initial theatrical run or focus primarily on the original trilogy. The Making of Star Wars was filmed in 1977 and aired on the ABC Television Network. The film is hosted by R2-D2 & C3PO and narrated by William Conrad. It shows behind-the-scenes footage and many interviews with George Lucas and the cast. Airing just 4 months after the original film was released, it has the honor of being first ever documentary about Star Wars. 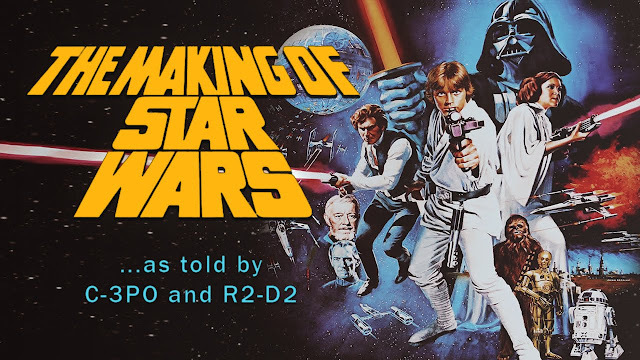 From Star Wars to Jedi: The Making of a Saga first aired on PBS in 1983 and was the bookend to three documentaries written by Richard Schickel. He wrote the aforementioned The Making of Star Wars and also SP FX: The Empire Strikes Back which was released in 1980. The 3rd film, hosted by Mark Hamill, focuses primarily on Return of the Jedi, but also includes interviews and footage from the previous films. Empire of Dreams: The Story of the Star Wars Trilogy is a 2004 film released with the DVD boxset that same year. The 2.5-hour movie goes in depth with making the original trilogy and the impact of the films 20+ years later. Plus, it features interviews with just about everyone ever associated with the original trilogy.